On April 26 NASA’s Cassini spacecraft will make its first dive through the narrow gap between Saturn and its rings. This is a region no spacecraft has ever explored – so Cassini will use its dish-shaped high-gain antenna (13 feet or 4 meters across) as a protective shield while passing through the ring plane. Astronomers expect no particles larger than smoke particles, but are taking the precautionary measure being that it is the first dive through this gap. The Cassini team will use data collected by one of the spacecraft’s science instruments (the Radio and Plasma Wave Subsystem, or RPWS) to ascertain the size and density of ring particles in the gap in advance of future dives. As a result of its antenna-forward orientation, the spacecraft will be out of contact with Earth during the dive. 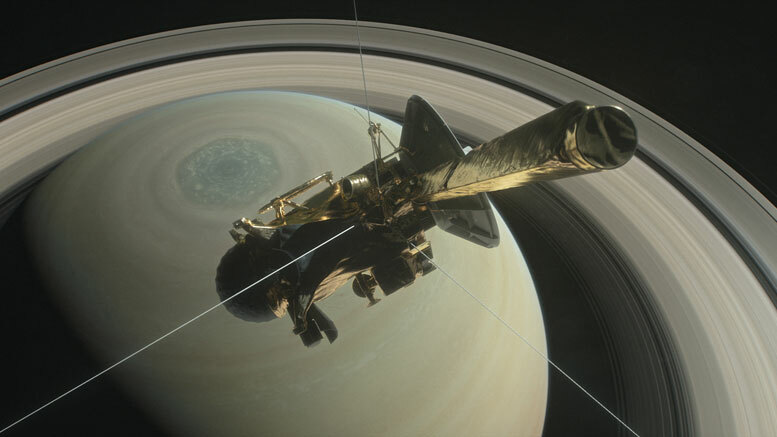 — 5 p.m. PDT (8 p.m. EDT) on April 25: Cassini is approaching Saturn over the planet’s northern hemisphere in advance of its first of 22 planned dives through the gap between the planet and its rings. — 1:34 a.m. PDT (4:34 a.m. EDT) on April 26: As it passes from north to south over Saturn, Cassini begins a 14-minute turn to point its high-gain antenna into the direction of oncoming ring particles. In this orientation, the antenna acts as a protective shield for Cassini’s instruments and engineering systems. — 2 a.m. PDT (5 a.m. EDT) on April 26: Cassini crosses the ring plane during its dive between the rings and Saturn. The spacecraft’s science instruments are collecting data, but Cassini is not in contact with Earth at this time. — No earlier than around midnight PDT on April 26 (3 a.m. EDT on April 27): Earth has its first opportunity to regain contact with Cassini as the giant, 230-foot (70-meter) Deep Space Network antenna at Goldstone, California, listens for the spacecraft’s radio signal. — Likely no earlier than 12:30 a.m. PDT (3:30 a.m. EDT) on April 27: Images are scheduled to become available from the spacecraft. Be the first to comment on "Cassini Spacecraft Set to Dive Through the Gap Between Saturn and Its Rings"